It's been a little more than 33 years since Mike Schmidt and George Brett last stood together on a baseball diamond in Philadelphia. Today, the two Hall of Famers will throw out the ceremonial first pitch as the Phillies open the home portion of their 2013 schedule at Citizens Bank Park against the Kansas City Royals. This Season: The Royals dropped their first two games of the season against the White Sox before avoiding a sweep and collecting a win on Thursday. The Phillies opened the season in a similar fashion, dropping two in Atlanta before winning last night behind eight strong innings by Cliff Lee. Pitching Matchup: Kyle Kendrick in 2012 (4.31 xFIP, 2.37 K/BB, 1.27 WHIP) vs. Wade Davis in 2012 (3.24 xFIP, 3.00 K/BB, 1.09 WHIP). About the Royals:The Royals last visited Citizens Bank Park in 2004, the two clubs have faced each other six times in the regular season via interleague play ... Wade Davis had a spectacular spring with the Royals, surrendering two runs over 14 innings .. Coming into Friday, the Royals were one of just four teams in the majors to have not yet hit a home run and were ahead of only Miami in runs scored with five. 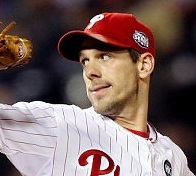 Odds: Phillies favored -120. Over/Under set at 7. 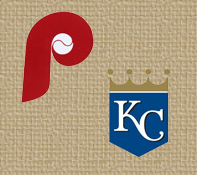 Phillies Lineup: Revere 8, Rollins 6, Utley 4, Howard 3, Young 5, Brown 7, Nix 9, Kratz 2, Kendrick 1.